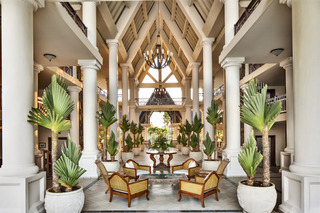 Inspired by the Turn-of-the-Century Plantation Houses, the Hotel is Reminiscent of the Palaces of Yesteryear; Each Refined Detail is a Tribute To the Deliciously Nostalgic Elegance of a Sophisticated Lifestyle. The Hotel Offers 135 Luxuriously Appointed Rooms and 28 Suites That Are Divided Into 7 Categories: Garden View Rooms (54 M???? ), Ocean View Rooms (56 M???? ), Ocean Front Rooms (58 M???? ), Garden View Junior Suites (86 M???? ), Garden View Senior Suites (106 M???? ), Colonial Ocean View Suites (164 M????) and Colonial Ocean Front Suites (116 M???? ).